Would you be interested in a nice, brand new, lightweight, single cylinder cafe racer? You're probably thinking, why bother asking, no one is making them, but maybe you're just not looking in the right place. Former NASA engineer Casey Stevenson of Ryca Motors had the same idea, he wanted a lightweight single to cruise around L.A. but finding few options he figured he could design his own, something with a Japanese single cylinder engine and a sort of modern cafe style. Then he saw the Suzuki Boulevard S40, the little belt drive cruiser, but he didn't see cruiser, he saw something else hidden right there, in plain sight. The S40, previously called the Savage, has been around for over 20 years but you can still buy them new. His idea was to transform the Suzuki with his own custom made parts and accessories, creating a kit in the process enabling anyone with basic tools to build their own urban thumper. The CS-1 features a 650cc single with 5 speeds, good looks and up to 60 mpg. For the prototype, I started with the tank. The bottom was chopped off, re-welded, and the entire tank was lowered with custom mounts. I made a tank plate to cover the cavity where the stock speedometer was located, which now houses the keyswitch and indicator lights. I then lowered the front forks and brought up the rear with longer shocks to level the tank and establish the horizontal line that follows through to the seat and side covers. This brought the rake and trail down a good amount, and I realized there was no need to build a custom frame like I had originally planned. The stock frame is narrow and kinda disappears into the background, making everything seem very sleek and light. For the seat, I chopped off the ends of the stock tubes and made a metal seat assembly that attaches to the existing mounting points. The entire piece is isolated from the frame with neoprene rubber to reduce vibration and can be adjusted depending on the weight of the rider. The cafe seat was made from fiberglass. I really like the belt drive of the stock S40, so I had the rear hub re-laced to a larger 18" rim. A custom battery box was created which doubles as a mounting point for the electronics, and fiberglass side covers were designed to match the contours of the seat and tank. The exhaust was modded to fit the reverse cone muffler, and I created a foot-actuated lever from the stock shifter to replace the heavy stock decompression solenoid. Custom speedo/tach brackets, belt guard, sidestand mount, and license plate bracket were fabricated. For the rearsets, I designed a one-piece bracket assembly: left and right cantilevers cross-braced horizontally with tubing, all TIG welded together. The bracket attaches to existing motor mounts. New grips, clip-ons, and air-filter complete the package. The Ryca CS-1 cafe racer is born! Everything is factory fresh. All custom components are new. The engine and chassis are from a brand new bike with zero miles. All custom components are new. The engine and chassis are from a low-mileage used bike in excellent condition. You bring us your S40. We make it awesome. The kit is for the do-it-yourself home builder and includes the custom parts made by Ryca. All components can be attached at existing mounting points. No welding required. Casey says this is the first in a planned series of bikes. If they can do a small run, instead of only one or two, the prices could come down. The idea is to invest profits back into the company and sell more bikes for less. I like the direction they're going here, start with an existing bike and transform it into a bike not available elsewhere. Sweet looks, nice price, I like it. If the CS-1 looks good to you, give Casey a call at Ryca Motors. Check out the Suzuki Boulevard S40 motorcycles for sale. Looks fantastic, well done Ryca. “You’re probably thinking, why bother asking, no one is making them, but maybe you’re just not looking in the right place.” <– I think the larger point is, why aren't any of the major manufacturers making something so beautiful? We here at Kneeslider get to see all of the lovely goodies you dig up for us, but what about the rest of the general public? At Last! Someone figured out how to de-uglify the ‘Thavage”. Great idea, and not extrememly expensive, as customs go. Please bring this bike to bike shows and let people see it, it’s beautiful. You might even sell a few. I’ll be watching for it. Very, very nicely done conversion. Let’s hope he sells a boatload of ’em. Beautiful work and a forgotten model that people should have capitalized for years. Finally someone did! Great job. Built in the “Brat”, “Deus” style which seems to be very popular and I really like it, but I’m a little fuzzy on the trend towards antique automobile look? Tire technology has progressed in leaps and bounds.Take advantage of it! Clarification for above comment, the “Auto” look I was referring to was only concerning the tires. It’s really a beautiful conversion ! That’s a pretty dramatic transformation for very little money. Definitely admire anyone who can turn a Savage into an object of desire! I imagine ‘mine’ with a breadbox tank to complete the look. Are the forks and headstock left alone? The whole front end looks a lot less cruiser-ish… What is meant by ‘lowered’? At the very least it looks like the forks were actually shortened not just slid up in the clamps. Great idea and the end result is beautiful. The S40 is fairly lightweight to begin with and doing away with so many parts will only reduce weight further. I’m curious what the new weight is and what a 30hp motor is capable of. The motor is the only thing that I’m reluctant about. A few years back, there was the Snorton, a featherbed/Savage hybrid available. But I like this one much better. I thing they were getting about 50 horsepower out of it. Thanks Paul, this bike is great! Very inspiring. This is why I look at your website everyday! I wish we could buy crate motors from the Japanese manufacturers like we can buy V twins……….. then WE can do our own creations. SO glad this is being done. I first saw a Savage Cafe a number of years ago in a BSA B50 frame. They called it a “BAZUKA”. http://www.b50.org/foto.htm (you can see my B50 here too). Great stuff, good motor and a 30hp 650 is just like what REAL bikes used to have. Wow. That would be a really fun around-town/local roads bike! Wow. Singles still rock with me. I prefer the flat-track style. This still looks so much better than the Savage it was derived from. That is a very nice conversion, I think I would have dropped the front wheel diameter down to 17″ rather than boosting the back as it would give greater tyre choice. I would need some mini indicators and a red lensed back light to make it street legal in the UK but I don’t think they would ruin the bike. Its very nice to see a project that seems achievable to us mere mortals looking so good. I ride a single and it is great fun. Seriously great looking bike. I am going to jump on a couple of bandwagons, and say that I would put modern tires on, and also think the forks look shorter overall. Is that just a trick of the camera? Anyway, I think that might get my wife on a bike… It’s both hot and a little cute. Maybe they can source the Suzy motor now the the half-Buell motor’s not available. Damn. I have a 2003 Savage that my wife rides and that I still take to work sometimes. It’s a fun bike. The kit is tempting. Neat and creative but,$9,500 is not a good price,lots of motorcycle options for 10 grand out there and that motor is very frail longevity wise. I dig it major, but price is an issue. I appreciate all the custom work, but $10k is a lot for what the bike ends up being, despite how awesome it looks. This is possibly the best thing that ever happened to a Savage/S40. Except the tires (Firestone replicas made by Coker), which are useless on wet roads. Hey, thanks for all the great comments! Regarding the tires – The prototype was a big experiment. I agree, modern tires will be a better choice. “I’m curious what the new weight is and what a 30hp motor is capable of” – The weight of the bike comes in at 320 lb wet. -Yeah they were shortened. The bike is tilted forward enough to bring the rake down to about 30 degrees, which really helps eliminate the chopper look. But the forks were still too long. There were no mods to the headstock or frame though. Regarding price – It’s just the best we can do at the moment, considering it’s such an extreme conversion. If we can get a few builds completed and sold, then the price could very well come down. Same with the kits. It takes some time to get the ball rolling. And $. Thanks again to The Kneeslider!!!!!! I haven’t seen any videos of this conversion out there? I’ve seen sloppy bobbers, but not this sweet ride!?! Nicely done! Mean, clean, and cool. I too thought the Savage would make a good cafe or street tracker. However, the engine is tall like a Norton International. A Savage engine in a Featherbed-type frame would look good – maybe with a fake cam drive housing up the side. interested in the comment that the motors are “Frail”: this is a DR650 motor isnt it? I thought they were stone-axe reliable? Oh, and I presume its on the stock 19 inch rim up front still? You could always drop that down to an 18 and use a lower profile tyre if you wanted to drop the front some more. One of the things I like the most about this is that I have seen a million of these bikes, and NEVER seen the potential in it. I will never look at one the same way again. Nope, the DR650 and S40/Savage engines are completely different. For instance, check out the way the Savage engine handles the cam chain tension. Bravo RYCA! Ever since I saw the first LS650 Savage I thought that tall vertical cylinder with its swept back exhaust header would look good in a café racer setting. Mid-size Jap cruisers do have some potential to go “café” style. 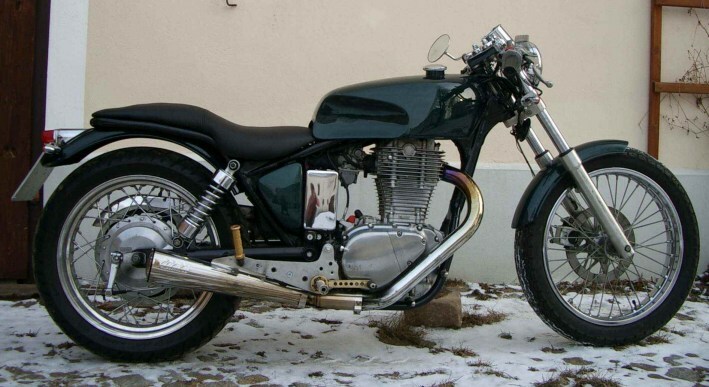 I’m working on trying to get a Virago 535 to look a little like an Egli-Vincent at the moment. Laugh if you like, but I’m having fun building it and riding it as it comes together. After I’m done, I might just contact the folks at RYCA for my next project. You’ve turned the ugly duckling into a swan – should make a cool commuter especially with the belt drive. How come not too many people other than the odd Suzuki, Kawasaki and most of the Harleys use belt drive? I no longer have to get all the crap off my back wheel on the Sportster. Great conversion and it uses the bike everybody takes no notice of – I think you can still buy the bike new in Europe but not in England now – time to start looking in ebay maybe..
Nice conversion – definitely an ugly duckling into a swan. AWESOME job! We bought my wife an S-40 last summer. Turns out the bike is a little too much for her so we bought her a Honda Rebel. I was thinking of selling the S40, but now……maybe I’ll just keep it for myself and do a conversion like this. Thanks for the inspiration! Very very nice. I’ve been contemplating a Savage street tracker rebuild. I’ve always believed this model had lots of potential. Inspiring to say the least. Jon, I think the cam chain and tensioning system is about the only unreliable component in the engine. That being said, if you stop by the suzuki savage forum (www.suzukisavage.com) you can hook up with people who have a pretty decent fix for the issue. Or, you could just do the right thing and replace the chain every so often. Also, the bike is good for quite a bit more than 60 mph. It’ll be huffing and puffing, but it can hit at least 80 or 85. With a chain conversion (also described on the forum) you can also tweak the top speed or acceleration to your liking. nice conversion with excellent workmanship. would be easier and less expensive to convert a GS500 to cafe. result would be functionally about the same, but without the unique appearance of this one. Jaw, floor, jaw floor. repeat. that is SO ssweet. I like that the motor has some cant to it (the Thavage motor irks me sitting straight up): this reminds me of a proper SR500. I have a 1991 DR650 laying around: I may have to consider something along these lines (though would never be as sanitary as this one). It will certainly do 70, as I know empirically. My GB500 @ 33HP will do over 100MPH (GPS confirmed). I always wondered why people say that SR500s or this bike would have problems going over 80. Even the little Ninja 250 with 28(?) horse will make or break 100. Of course, I’d hate to go over 50 with those tires. Excellent conversion. I’ll be waiting to see the scambler version, though. Street tracker version could be nice…..
Nice work! Very inspirational for those out there looking for newer and reliable mounts. 320 pounds is a nice, light bike. 275 would be better! I think you also have created something that is proven and safe by not chopping up the frame. You pretty much eliminate a bunch of liability associated with those types of modifications. Many custom jobs I’ve seen look they they have been welded by someone in their garage with a crappy flux -core welder and look pretty unsafe to me. Certainly, they come nowhere near the engineering redundancy you see coming out of the big manufacturers. Talk to guys like Wrenchmonkees and they will tell you that authorities in Denmark, where they are located, won’t allow you to cut anything on the frame except for the very end of the seat tubes. We have it real easy in America where you can cut and chop all day long and no one says anything about it! Regarding the wheel sizes, this think would never look so right if the front hoop was swapped out for a 17″. The wheel sizes really matter here and help give it the right look. 18″ or 19″ rears and 19″ fronts were a standard for many years and help give the bike a very classic and well proportioned look. Personally I love the look of bigger spoke wheels and would be happy to see 21″ rings front and rear! I agree that newer tech tires are in order here. I considered the Savage a tidy little package but this treatment takes it to a new and much cooler place. And checking Craigslist, I see the starter bike is available everywhere and can be had for just a few beans. After I finish my Harley flathead . . .
I’ve owned three SR500’s and 90mph is about it. And that was really laying down. My DR650 will hit 95 ducking down. I’m 5’9″ and 165. I guess I could see a GB500 doing over 100. Downhill, tailwind, etc. 105mph shown on the GPS across the San Mateo Bridge on a calm Sunday evening. My wife was on the back of the GB500 (Corbin seat that I swap out now and then) and she was wearing a large back pack from our camping trip on the coast. Maybe that improved our aerodynamics. Heck, I’ve had my Honda XL350 Cafe up to 87 (using the same GPS) on 880 in Oakland. It had 24HP according to Powroll and I only let off because I could no longer see through the vibration. Sweet little bike…and my wife is selling hers?? Would the same treatment work on an Intruder 1400? King Vitamin – no. The Intruder 1400 is simply too nasty to be saved. I’ll always have a soft spot in my heart for the Savage. I got back into motorcycling because of a real good deal on one back a few years ago. Mine would cruise at 75 on the interstate with no effort. Top speed was 90 something with no muffler, in the 80’s with stock muffler. The perfect muffler for mine turned out to be a Ford tractor muffler, painted flat black, from Tractor Supply, no less! This is a nice treatment. I wish I had not sold mine now, ha! This is a nice conversion, the Savage has always had a great looking motor, though a bit tall due to OHC. I agree with Bazuzeus, as that conversion looks better. A nice GB 500 can be got for less than 4 G’s, but I’d bet the Savage has more thump to tha rump! Was just thinking about a belt conversion to a small metric and here it is. Looks great and for the price of a few add ons and some fabrication its yours. I’d love to get one of these. I had an S40 & sold it after 4K miles. Loved the torquey engine & it hauled my 250 pounds around easily, sometimes with a passenger. But I hated that chopper chassis. I always thought, “This engine in a nimble chassis with mid-set pegs would be the perfect bike.” Well, here it is. I’m keeping my Vstrom but I’m saving for one of these now too. This is very tasty stuff, indeed. I just dropped them a note to tell them that if I hadn’t just bought a brand new Sportster, they would be getting my money right now. As it is, I’m going to start saving up for a second bike. I have always loved singles, and this is just a lovely re-imagining of a nice, reliable utility commuter to turn it into something much more fun and useful. Kudos. Brilliant. I really, really want one! Nice bike.Now a flat tracker,please. When I saw the first Savages, I was impressed with their simplicity and reliability (I once met a fellow who was touring around the country with his and he had no trouble). The boys and girls at Ryca have taken a mundane but good bike and turned it into a magic machine with great classic lines. I own a ’72 BSA B50 thumper, and the CS-1 is what that bike should be! Fabulous work — just do something about those 1950s tires. Wow. I’m going to get one. Mark my words. I’d actually like to pick up a used S40 and do the conversion myself. I think it would be a blast. Hopefully the price for the kit will come down, but even at $3,600 it’s still worth it. My only question is: Does the kit come with EVERYTHING you need? Like, the bigger rear wheel and everything? Oh, read the parts list. Kid doesn’t come with shocks or the bigger wheel. Well…All you have to do is buy Suzuki ST400 Tempter? so much fun in winding road. I like it, but I think it needs a Benjie’s tank and tail kit. I always wanted to make a cafe racer out of a savage, and this guy did a good job, but the tank needs a hump, and the tail needs to be a bit bigger and longer. Like I said, Benjie’s kit!! Love the look!! Can you get any HP outta these engines. They sound totally bulimic. Is this 650 engine shared with any other models, like a Dual Sport, where we can steal some HP parts? Any known performance mods readily available or are we back the shade tree days? Hoyt Olsen; short answer: No. If it’s power you’re after, look no farther than a BMW S1000RR. Nope!! Notta gonna do it. The engine for this little beastie is a DR800. 52hp stock! !Got the plan man. Gonna plasma some mount plates, beef the swing arm and run a chain. Tell me why I shouldn’t. I don’t know enough about these pee-poppers to know I can’t. They created what a lot of us have been dreaming about. Kudos, guys. Check out the 12/2010 Cycle World – page 8. Neat article by Mark Hoyer on this bike and the people behind it. Back in ’00 I was tempted to do something similar with my wife’s ’97 Savage, but only utilizing the motor in a different frame. Saw the Snorton but that was too much $$$. She didn’t like the forward controls or the excessive head drop at parking lot speeds. Along came the Blast so we went that way. I never dreamed you could transform the Savage in such a dramatic fashion with so simple changes! Really, really nice conversion. As a follow up I’d like to see a street tracker or standard style model with an upright riding position, for the ‘older’ rider. As far as power goes, nitrous oxide could safely boost the 30hp to about 45 or 50 and the bottle would fit on the front downtube. So 330# wet (with nitrous bottle) and 50hp should make for a quick ride.. I was inspired by your bike & decided to go all in with my 08 S40… I didnt even have to alter the gear shift shaft, I just swung it back to the newly positioned footrest shaft, which was made by inserting 15mm rod through the existing holes in the frame. I removed the risers & just cut the old forward controls off… Man that felt good. Now in this configuration its so controlable. The the best value solution if you want a good road bike with belt drive under 8K.. Thanks for the motovation & I like that one in the link here too. SeeYa! Unas de las mas lindas cafe racer que jamas e visto. Preciosa!!! One of the most beautiful motor bikes I never seen! For how much is the conversion selling? I wants! I think that the seat will be really uncomfortable, and so reduce the motorcycle to a toy. i have nothing but the best things to say about my RYCA and the guys at RYCA. i live in minnesota, bought an S40 in california, had it trailered to RYCA and they did the full conversion…even adding some great mirrors and front turn signals that didn’t mess up the look. the bike is fantastic. it’s fun to ride, light, fast. sadly my triumph bonneville just sits in the garage now and feels like an over-bloated buick compared to the RYCA. the price/value is fantastic. you get a fun, nearly “one of a kind” bike that’s reliable, economical (i get 55mpg) and looks cool. the only downside of the bike is i’m constantly being flagged down by people that want to know what it is. can’t wait to see what they do next. Does the kit come with instructions on the build? Measurements on cutting tail frame, front forks, exc? Also what about the turn signals? I had a ’95 Savage -my first bike- and i put a ton of miles on her. I made it from San Diego to Minneapolis and back again with no problems. 110 degrees in Vegas one day, 20 degrees (and snowing) in Vail the next. The engine was solid, and I had a fine time. I sure do wish I had her back for this conversion, even though my SV would no doubt be jealous! I have a friend who just finished his and I think I’m going to make this my next project. Finaly an affordable custom cafe bike that’s new and reliable And it’s a Suzuki!